Fig. 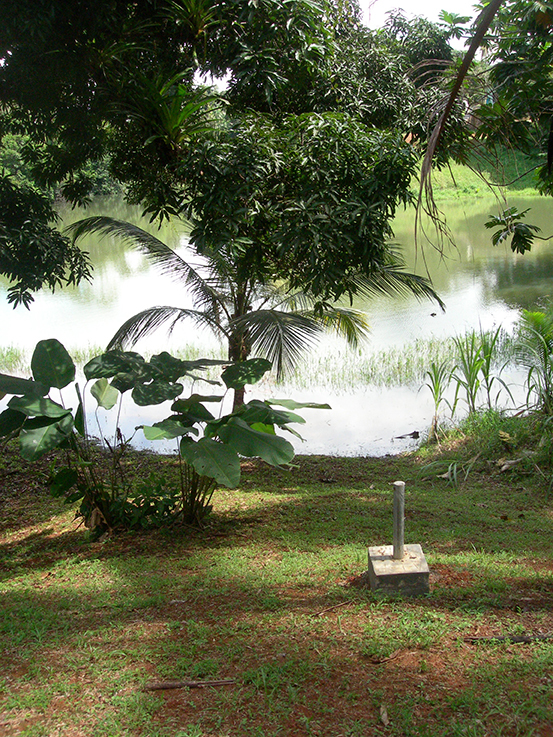 1: Boundary marker near Gatun Lake in 2008. Today, the monument identifies the administrative space of the Panama Canal Authority, a domestic state institution. In the twentieth century, US canal administrators placed metal rods along the boundary between the US Canal Zone and the Republic of Panama, as well as around canal-administered water sources. The Panama Canal moves an estimated 5% of global seaborne trade (Rodrigue et al. 2013:33). Unbeknownst to many, canal operations depend on a continuous supply of fresh water. The canal uses river water stored in two large artificial reservoirs to move oceangoing ships up and over the spine of Panama via a series of six locks. Unlike the sea-level, saltwater Suez Canal, each Panama Canal ship transit releases 52 million gallons of fresh water out to sea. The canal has averaged around 37 transits daily in recent years. Thus, canal lockages use nearly 2 billion gallons of fresh water on an average day, which is more than the individual water use of 18 million Panamanians (at 106 gallons per person per day). To put this comparison in perspective, consider that the entire country of Panama has a population of less than 4 million people. Eneida described her discovery of the metal rod as a moment of recognition. Juan’s narrative linked the uneven geopolitical relationship between the U.S. and Panamanian governments to the historical experiences of rural displacement associated with supplying water for the canal (Carse 2014). The rod revealed a regional hydropolitics. Since 1906, when the U.S. government decided to build a freshwater lock canal instead of a sea-level design, regional water supply has been a recurring concern for both infrastructural and environmental reasons. First, the canal system is interconnected with national water and power networks. The major reservoirs that provide water for shipping, Gatun Lake and Alajuela Lake, supply most of the potable water for the nearly 2 million people that live in the urban sprawl that stretches from Panama City (the nation’s booming capital and canal’s Pacific terminus) to Colón (a neglected city by the Caribbean terminus). Second, regional precipitation is typically characterized by a rainy season from May to December and a dry season from January to April. Water is plentiful, even excessive, in the rainy season. But the dry season can push the stored water supply to its limit, particularly during drought years when the beginning of the rainy season arrives later than expected. For Eneida, the metal rod illuminated infrastructural relationships linking her body, farm plot, and community to the canal and its dispersed publics, including the state institution that manages the waterway (once American, now Panamanian), the shipping firms that make up its clientele, and the transnational networks of transportation, logistics, and business actors that are indirectly dependent on the waterway. Given the networked character of shipping and municipal water infrastructures, droughts can bring these uses—and, by extension, their publics—into tension. Nearly 50 years after Juan predicted that the canal administration would extend the water storage system further into rural Panama, his words may come true. In August 2015, the Panamanian government declared a state of emergency due to an El Niño–related drought and proposed increasing water supply by creating another large reservoir. But if the drought was an emergency, what kind of emergency was it? Media and political narratives often present droughts as meteorological events: abnormal precipitation deficits that reflect disruptions in atmospheric circulation like El Niño. This framing implies that droughts arrive suddenly and come from the outside, eliding the historical construction and spatial interconnection of thirsty infrastructural networks that create conditions of possibility for shortage. Droughts are, by definition, temporary and caused by abnormal climatic conditions (Kallis 2008:86). This distinguishes them from normal dry conditions like aridity. In practice, however, the droughts that people define as emergencies are not meteorological events, but socioeconomic problems: instances in which water demand approaches or exceeds a climate-related deficit in supply (Garza 2003:343). I propose that we conceptualize Panama’s drought and others like it as infrastructural events. This framing highlights two key points. First, droughts, like other natural disasters, are not temporally or spatially discrete phenomena. They are environmental manifestations of how infrastructures become intertwined with the more-than-human world through the accretion of sociotechnical decisions and, crucially, of how water shortage in a given region can be influenced by the built national and transnational networks that circulate liquid from one place to another. Second, infrastructures can naturalize some water uses in ways that shape the emphases of drought response and the capacities of various publics to make claims. Sometimes this infrastructural invisibility is an outcome of a given community’s distance in time or space from the mundane organizational work that allows large, complex systems to operate. Sometimes it is an outcome of concerted efforts to manage environmental and political variability, dependency, and vulnerability (Benson 2015; Starosielski 2015). Eneida and Juan were among a handful of families who, beginning in the 1950s, settled the steep, forested lands along the Boquerón River. Word had spread through campesino networks that this region was tierra libre (free land), where a hardworking family could make a living by farming. But, even then, as the metal rod revealed, the water flowing across that land was not free. Fig. 2: For most of the twentieth century, the US government controlled the Canal Zone (shaded), a quasi-colonial enclave that split Panama in two. It also managed water across the entire Chagres River basin for shipping and other purposes. From 1903 to 1979, the U.S. government exercised quasi-sovereign power within the Canal Zone (more than 500 square miles) and managed water across an even larger swath of Panama. 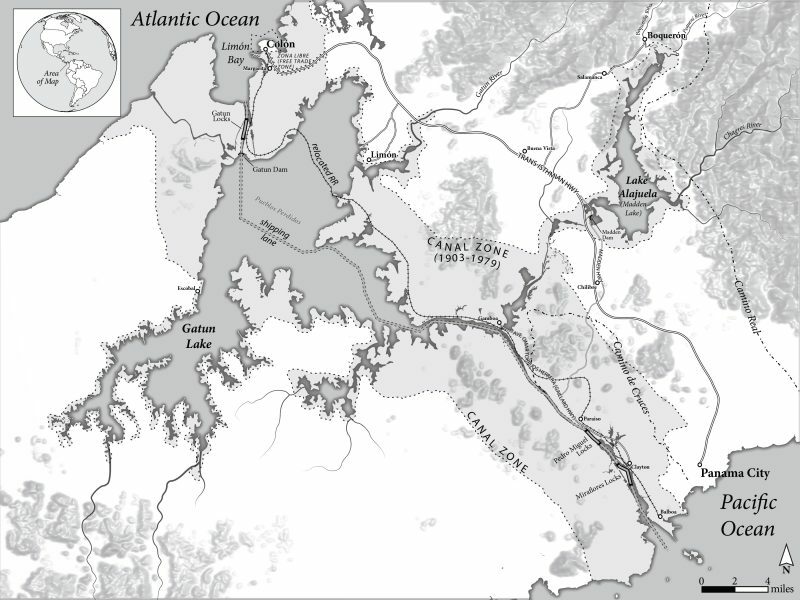 According to the terms of the 1903 canal treaty, the United States had authority over the water drained by the 1,300-square-mile Chagres River basin, which extended deep into Panamanian territory (see Figure 2). Thus, the U.S. government managed the Boquerón River as part of an extensive system of rivers and lakes. Metal boundary markers were placed along the rural sections of the Canal Zone–Panama boundary and around the canal’s water sources, where Eneida found one. The United States exercised its imperial power in Panama through conventional geopolitical means such as exploitative treaties, but also through the material politics of the engineering projects that we now call infrastructures (Carse 2016). In the first two decades of the twentieth century, the U.S. government enacted a sprawling sanitation campaign to control malaria and yellow fever around the canal. Yellow fever was primarily an urban problem due to the feeding and breeding preferences of the mosquito Aedes aegypti, its vector; the virus thrived in tropical port cities without modern water and sewer infrastructures like Panama City and Colón (Sutter 2016:253). Thus, yellow fever control entailed managing disease ecologies emerging at the intersection of demographic conditions, local water use practices, and built environments. A. aegypti did not respect the political boundary between Panama and the U.S. Canal Zone, so American sanitarians worked with their Panamanian counterparts to reengineer Panama City and Colón. They built paved roads, sewers, and piped water systems to eradicate the open-water sources such as cisterns, rain barrels, latrines, and muddy streets where the mosquitoes bred. The U.S. government built urban infrastructure in Panama not to promote modernization, per se, but to protect the health of white U.S. citizens in adjacent Canal Zone communities. The sanitary engineering projects established a public defined by the material and symbolic power of imperial pipes, cables, and roads rather than political representation. Water and sewer systems linked bodies and households to the body politic (Anand 2011; Bakker 2012), forging an infrastructural public that did not map onto the geography of the nation-state. The Panamanian government got modern infrastructures and the United States established a sanitary buffer around the Zone. Eneida’s discovery on the riverbank took place about a decade before U.S. President Jimmy Carter and Panamanian leader Omar Torrijos signed a treaty in 1977 that would gradually transfer both the canal and the Canal Zone from the United States to Panama by the year 2000. The treaty also initiated the transfer of administrative authority over regional water sources to Panama. In 1997, the Panamanian government created the Panama Canal Authority (ACP) and gave it the mandate of managing the canal for profit and “the human and socioeconomic development of the country” (Government of Panama, 1997). The quasi-autonomous state institution has operated the canal since 2000. Since then, the ACP, like its U.S. predecessor, has been responsible for the administration, maintenance, and use of regional water resources. Today, the gringo engineers are gone, but the metal rods endure, a reminder that canal administrators still manage the region’s lakes, even though the waterway is now under sovereign control. Not only does the ACP manage reservoirs for ship transits, it also sells their water to the national water utility for municipal use and sells their hydropower to the national electrical utility (Panama Canal Authority 2014). It is not rainfall alone, but this historical assemblage of transportation, water, and power infrastructures that shapes how drought unfolds on the isthmus. In 2014, Panama was the fifth rainiest country in the world (World Bank 2015). By August 2015, with the annual rainy season months overdue, the Panamanian government declared a state of emergency because an El Niño–related drought had affected more than two-thirds of the country. Concern was most acute in the metropolitan region around the canal. The government responded by suspending new water concessions for landscaping and agriculture, creating a water security commission to coordinate institutional efforts, and initiating a media campaign called “Gota a gota, el agua se agota” (“drop by drop, the water runs out”). The campaign asked residents to take individual responsibility for the drought response by reducing everyday consumption. 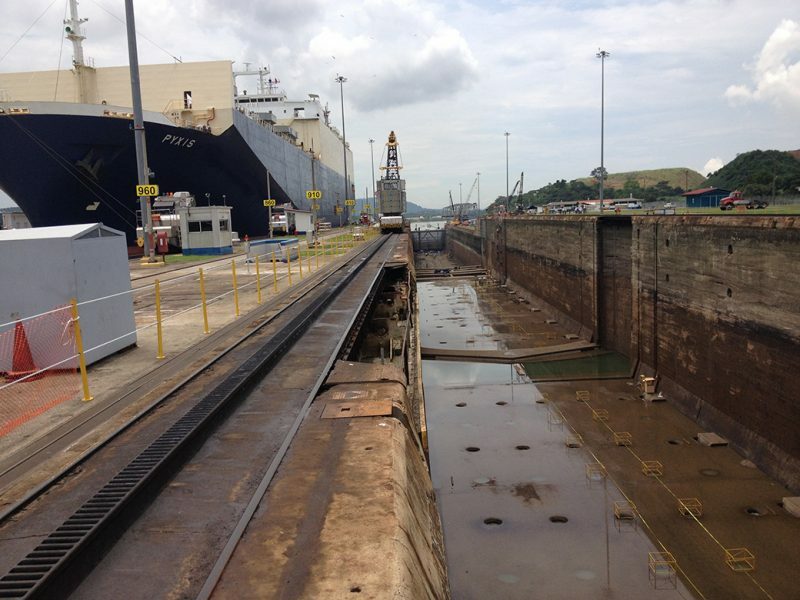 The Panama Canal Authority announced plans to reduce the maximum ship draft—or depth below the water line—by 6 inches due to low water levels (which would force some ships to reduce cargo). After some rainfall, however, the restrictions planned for September were suspended. By the time I arrived in Panama in September 2015, the conversation was shifting from an emphasis on reducing demand to increasing supply. I attended a speech by President Juan Carlos Varela in Panama City about water problems. Speaking to a well-dressed crowd who had each paid 35 dollars to attend the event in a posh hotel, Varela attributed the national emergency to El Niño, deforestation, climate change, and individual consumption. He began by citing Pope Francis’s encyclical—water is a human right—and concluded with a proposal to flood a new lake linked to the canal, which would displace an estimated 2,000 people in the process. Figure 3: During a drought in 2015, Panamanian President Juan Carlos Varela proposed the creation of a new reservoir on the Indio River to increase regional water supply. Sitting in the audience as Varela discussed the project, I recalled what Juan had told Eneida decades before: “There will come a day when they will flood all of this and we’ll have to move up higher.” The drought was framed as a national emergency: an abnormal meteorological event that might portend a dryer future or a “new normal.” But many rural people in the region would have recognized it as an “old normal” that fit a clear historical pattern of enclosure and displacement. 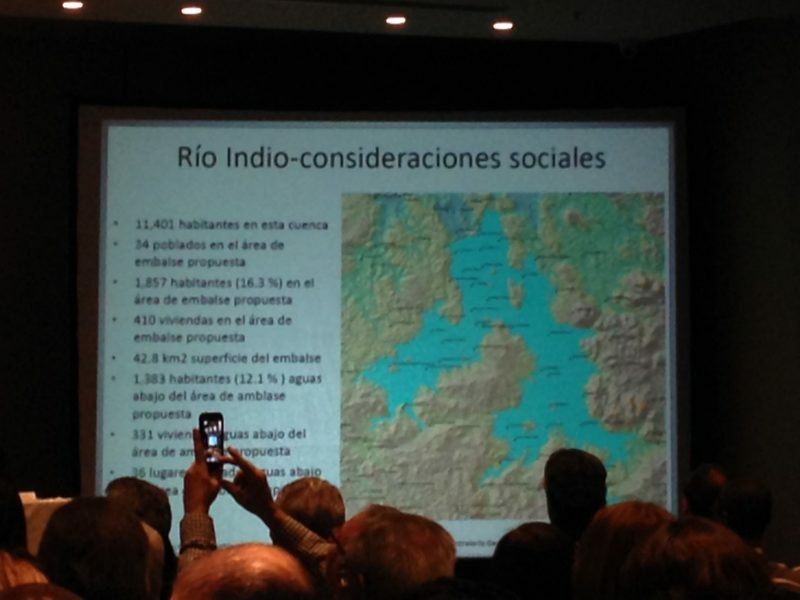 Given the expansionist hydropolitics of the U.S. era and its relationship to issues of Panamanian sovereignty, I was surprised that nobody asked the president about the proposed lake or projected human displacement that was glossed as a “social consideration” during the hour-long question and answer period that followed. I should emphasize that the audience that night was a specific public, representative of the economic and political elite, not the rural and urban poor. I have no doubt that the reservoir proposal would have provoked questions elsewhere in the country. Political ecologists (Bakker 2000; Kaika 2006; Swyngedouw 2015) characterize droughts as socionatural phenomena that emerge at the intersection of meteorological variability, socioeconomic water demand and collective behavior, and broader discursive fields. But when do they begin? And where do they come from? Building upon the political ecology literature, I argue that some droughts can be seen as infrastructural events: slow disasters that are decades—even centuries—in the making and bound up with global circulatory systems built by humans. Historian Scott Knowles (2014) observes that disasters unfold slowly, but we only tend to pay attention to their end points. It is no surprise, then, that politicians and pundits on the isthmus looked forward, not back. They predicted that drought might become normal—a permanent feature of modern life (Taylor et al. 2009)—due to climate change. While low rainfall is undeniably a manifestation of atmospheric patterns, drought also underlines how systemic risk (Collier and Lakoff 2011) can be built into the environment through infrastructure and made invisible through practices of insulation (Benson 2015; Starosielski 2015). At 52 million gallons per transit and 2 billion gallons per day, the Panama Canal uses an enormous volume of water, but political discourse and policy responses to drought did not emphasize reducing its use. Conceptualized as an infrastructural event, the drought draws our attention to how Panamanian rainfall, rivers, institutions, and cities are linked to the metabolism of global transportation and trade. Panama is far from the only illustration of how planetary connection can format situated experiences of and responses to droughts. The emerging global virtual water trade network (Dalin et al. 2012) promises to shape the geography of drought occurrence and response in the future. In California, for example, the export of water-intensive crops such as almonds, pistachios, cotton, and rice siphons billions of gallons from the state’s water supply. Almond and pistachio farmers used 1.245 trillion gallons of water in 2010—second only to alfalfa—and exported two-thirds of the nut crop (Philpott and Lurie 2015). There is an interesting, if imprecise, parallel to the Panama drought here. In both cases, the drought response discussion placed relatively little emphasis on the sectors using the most water. However, the canal does not produce commodities: it moves them. Its water problems are shaped by the infrastructural logic through which global transportation systems transform and make environmental demands on the places they cross. In the absence of the demands of these infrastructures and their far-flung publics, there is no drought in the socioeconomic sense. Fig. 4: The Panama Canal’s locks require an enormous volume of fresh water to operate. Canal reservoirs also provide municipal water and hydropower for nearby cities. Engineered infrastructures provide an experience of environmental control, particularly over the short term and at smaller spatial scales. They provide warmth in winter, light at nighttime, fresh fruit out of season, and water in the dry season (Edwards 2003:188–189). But analyzed over longer periods and at larger spatial scales, our infrastructures—precisely because they buffer some of us, much of the time, from environmental processes—create the conditions for what Mike Davis calls “ordinary disaster” (1999). Through engineering hubris, false environmental assumptions, and shortsighted development policies, infrastructures facilitate and direct growth that they can ultimately no longer sustain. And yet, because economic development and cultural expectations are attached to the built environment thus produced—because systemic relations have momentum—it becomes difficult to change, to talk about reduction or redistribution rather than addition. Eneida and Juan’s names have been changed. Estimate is based on 2010 figures provided to the news agency EFE by Panama’s national authority of public services that place per capita consumption of potable water in Panama at 106 gallons per day, the highest in Latin America. Meanwhile, as the article notes, 16% of the population has no access to potable water. See Agencia EFE (2010). The United States–Panama Treaty of 1903 gave the United States extensive territorial power and environmental control within the Canal Zone. According to the treaty, the United States controlled the water that drained into the canal and could appropriate more territory for water or other uses deemed necessary for the “use, sanitation, and maintenance” of the waterway. The proposed site was the same location where, a decade before, the canal authority had attempted to create a reservoir to provide more water for an expanded canal before campesino social movements, the Catholic Church, and environmental groups succeeded in halting the project. The canal expansion proceeded and is slated for completion in June 2016, but the reservoir plan was shelved for nearly a decade until the 2015 drought response. This material is based upon work supported by the National Science Foundation under Grants No. 1257333 and No. 1560534. Anand, N. 2011. “Pressure: The Politechnics of Water Supply in Mumbai.” Cultural Anthropology 26(4):542–564. Bakker, K. J. 2000. “Privatizing Water, Producing Scarcity: The Yorkshire Drought of 1995.” Economic Geography 76(1):4–27. ———. 2012. “Water: Political, Biopolitical, Material.” Social Studies of Science 42(4):616–623. Benson, Etienne. 2015. “Generating Infrastructural Invisibility: Insulation, Interconnection, and Avian Excrement in the Southern California Power Grid.” Environmental Humanities 6:103–130. Carse, Ashley. 2014 Beyond the Big Ditch: Politics, Ecology, and Infrastructure at the Panama Canal. Cambridge, MA: MIT Press. ———. 2016. “Keyword: Infrastructure–How a Humble French Engineering Term Shaped the Modern World.” In Infrastructures and Social Complexity: A Routledge Companion, edited by Penny Harvey, Casper Bruun Jensen, and Atsuro Morita. London and New York: Routledge. Collier, Stephen J., and Andrew Lakoff. 2011. “Introduction: Systemic Risk.” Limn 1. Available at link. Dalin, C., M. Konar, N. Hanasaki, A. Rinaldo, and I. Rodriguez-Iturbe. 2012. “Evolution of the Global Virtual Water Trade Network.” Proceedings of the National Academy of Sciences of the United States of America 109:5989-5994. Davis, Mike. 1999. Ecology of Fear: Los Angeles and the Imagination of Disaster. New York: Vintage. Edwards, Paul N. 2003. “Infrastructure and Modernity: Force, Time, and Social Organization in the History of Sociotechnical Systems.” In Modernity and Technology, edited by Thomas J. Misa, Philip Brey, and Andrew Feenberg, 185–226. Cambridge, MA: MIT Press. Agencia EFE. 2010. “Panamá es el Mayor Consumidor de Agua per Cápita en América Latina.” March 23. Available at link. Garza, Roberto. 2003. “Droughts.” In Encyclopedia of World Environmental History, edited by Shepard III Krech, J. R. McNeill, and Carolyn Merchant, 342–347. New York and London: Routledge. Government of Panama. 1997. Asemblea Legislativa Ley No. 19 (De 11 de junio de 1997) Por la que se Organiza la Autoridad del Canal de Panama. Available at link. Kaika, Maria. 2006. “The Political Ecology of Water Scarcity: The 1989–1991 Athenian Drought.” In In the Nature of Cities: Urban Political Ecology and the Politics of Urban Metabolism, edited by Nik Heynen, Maria Kaika, and Erik Swyngedouw, 157–172. New York and London: Routledge. Kallis, Giorgos. 2008. “Droughts.” Annual Review of Environment and Resources 33(1):85–118. Knowles, Scott. 2014. “Learning from Disaster? The History of Technology and the Future of Disaster Research.” Technology and Culture 55(4):773–784. Panama Canal Authority (ACP). 2014. Annual Report for 2014. Available at link. Philpott, Tom, and Julia Lurie. 2015. “Here’s the Problem With Almonds.” Mother Jones, April 15. Available at link. Rodrigue, Jean-Paul, Claude Comtois, and Brian Slack. 2013. The Geography of Transport Systems. London and New York: Routledge. Starosielski, Nicole. 2015. The Undersea Network. Durham, NC: Duke University Press. Sutter, Paul. 2016. “‘The First Mountain to Be Removed’: Yellow Fever Control and the Construction of the Panama Canal.” Environmental History 21:250–259. Swyngedouw, Erik. 2015. Liquid Power: Contested Hydro-Modernities in Twentieth-Century Spain. Cambridge, MA: MIT Press. Taylor, Vanessa, Heather Chappells, Will Medd, and Frank Trentmann. 2009. “Drought Is Normal: The Socio-Technical Evolution of Drought and Water Demand in England and Wales, 1893–2006.” Journal of Historical Geography 35(3):568–591. World Bank. 2015. “Average Precipitation by Depth (mm per year).” Streaming database available at link.